UPDATE 1 (2018-1-15): Martin Weiser notified me that the Korean version of the article includes the company information (Note to readers: When doing research using the North Korean media, look for the original Korean article!). The company that produces the Naenara vehicles is the Chongpung JVC (AKA 청풍합영회사/Chongphung)–and it looks like they have been around for a while. You can download a video of the 13th Pyongyang Spring Trade Fair (held in 2012) here, and in the video you can see Chongphung JVC participating. 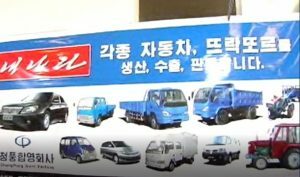 ORIGINAL POST: The North Korean news portal “Naenara” announced “Naenara” brand vehicles over the weekend. The Naenara-brand rolling stock consumes low fuel, and has air-conditioner, servosteering function and motor-windows. 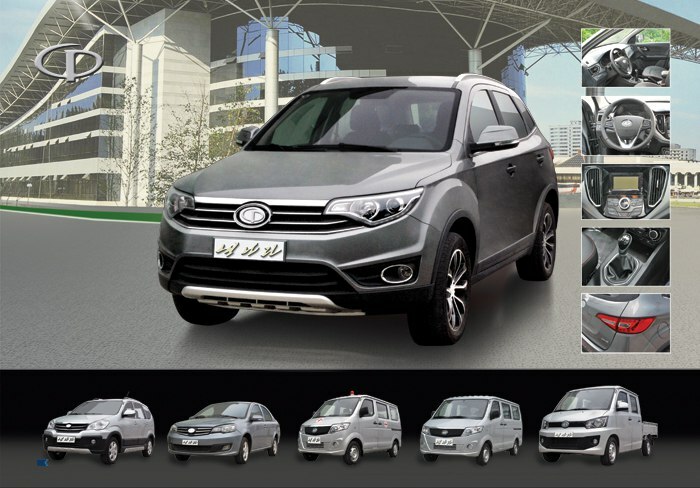 They are equipped with such control systems as motor-driven exterior rear view mirroring, start-stop, and backward alarm systems. 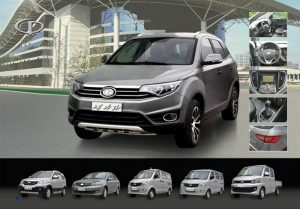 I did a quick check to see if these vehicles may simply be re-branded Pyeonghwa Motors vehicles, but I could not find any matches. 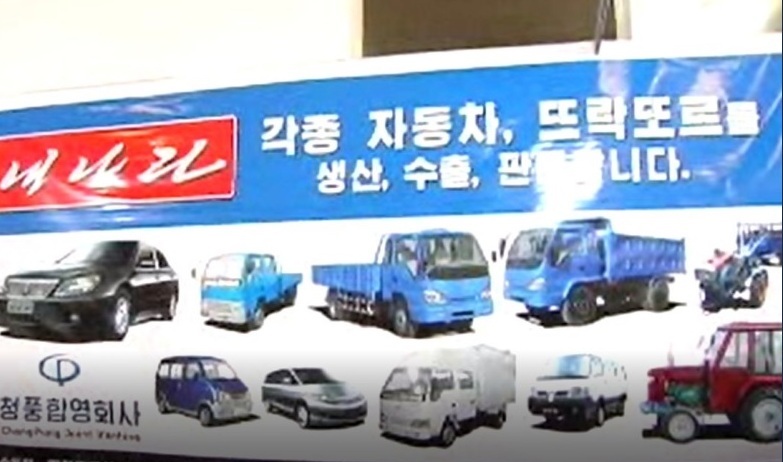 I have not seen any new vehicle factories appear in the North Korean media, so I assume an existing vehicle factory has launched a new product line. It is possible that a military vehicle factory has launched a new product for the civilian economy. Very little data as of now, however, so we will have to wait and see. If any tourists or visitors spot these cars, please take a picture of them (the marketing pics are all computer generated). Fuel availability, especially for the civilian economy, has been a topic of interest by outside observers in the last year as UNSC resolutions have sought to restrict imports from abroad. 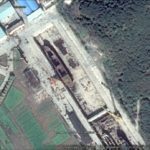 Seemingly taking an interest in the welfare of the public, Kim Jong Un, Chairman of the State Affairs Commission, before his visit to a soap factory, has spent the previous month visiting a medical device factory, spring water bottling facility, a ‘sovereign’ factory, and the Ryugyong Dental Hospital. On October 29, Korean Central News Agency (KCNA) reported that Kim Jong Un also toured the newly constructed Mount Ryongak Soap Factory. Of late, newly constructed or refurbished factories producing consumer necessities have featured prominently in the North Korean media. Last June, Kim Jong Un visited the Mount Ryongak Soap factory construction site, gave it its name, and directed that it should be completed by the anniversary of the Worker’s Party foundation (October 10th). In addition, he visited the Mount Ryongak Spring Water Bottling Facility in September and ordered for normalizing increased production standards, delivering spring water produced at the right time, and standardizing and varying the color and shape of glass bottles. It was at the direction of Kim Jong Il that the Mount Ryongak Spring Water Bottling Facility opened in 2007, to supply the people of Pyongyang with water from the mountain, while Kim Jong Un is credited with having it refurbished and modernized. Kim Jong Un also gave on-the-spot guidance at the Mangyongdae Revolutionary History Sovereign Factory. While there he said “I like the fact that we are using our own raw materials and products to make zippers. The Party’s directive to domesticate production has achieved great results.” Completed in December 1979, the factory’s products were praised by Kim Jong Il at the August 1984 Pyongyang Light Industrial Products Exhibit. 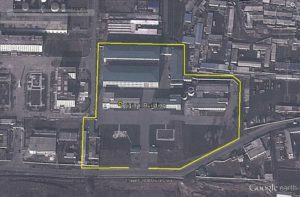 In addition, KCNA reported that Kim had instructed that the factory be refurbished and modernized. I have a lot of information laying around that I intend to use in publications, but sometimes that information doesn’t make it out the door where it can do other researchers any good. To help fix this I have put together a three-part “Orphan Information” series to remedy the problem. 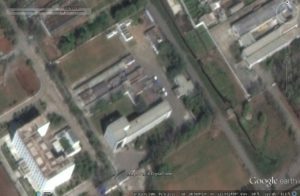 This is part 1, and it features additional information on the Pyongyang Bio-technical Institute run by Korean People’s Army Unit 810 which was the subject of an article in 38 North by Melissa Hanham in July 2015. The information below helps to clarify the history of the facility and offers more hints as to its uses. The facility has gone by two previous names in North Korea (of which I am aware): First it was known as the Patriotic Complex Microbial Center, then it was changed to the Vitamin C Factory at the Pyongyang Biotechnology Center. The current name is probably the third (in English). I have uploaded to YouTube two videos of the facility that were broadcast on North Korean Television. I have not had either video translated, so if you speak Korean and think there is anything interesting in these videos, please let me know. As of 2000, the chief of the Aeguk Compound Microbe Center was Kim Ung Ho, who was also chairman of the DPRK Invention Committee. In early 2011 construction began around the Patriotic Complex Microbial Center. When construction was completed, North Korea announced the Vitamin C Factory. As you can see from comparing the images of the Patriotic Factory and the Vitamin C Factory, there was a substantial amount of work completed; however, the original building was not torn down, though its exterior (and probably interior) have been altered. 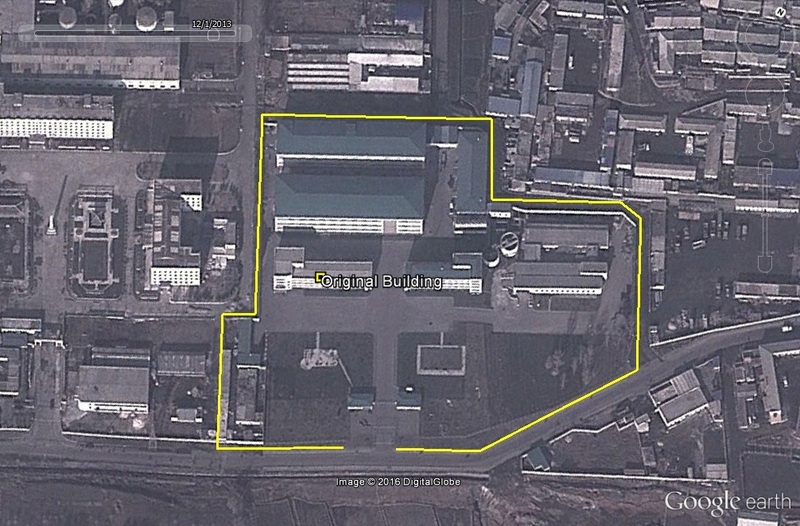 Pyongyang, August 9 (KCNA) — The Vitamin C Factory has been commenced with due ceremony on Friday. It was built on the bank of the River Taedong in Pyongyang. The vitamin C producing base has the latest production processes that use bioengineering methods. The factory helps make another achievement in carrying out the behests of leader Kim Jong Il, who worked heart and soul to improve the standard of people’s living, and will greatly contributing to promoting health of the people. Present at the ceremony were Pak Pong Ju, Choe Thae Bok and officials concerned, officials of different units, builders, youth shock brigade members and officials and employees of the factory. Pak Sun Chol, general director of the Korean Taeyang General Company, made an address. At the end of the ceremony the participants went round the factory. Pyongyang, August 16 (KCNA) — Marshal Kim Jong Un, in the 2013 New Year Address, set the building of a strong economy as a key issue in accomplishing the cause of building a thriving socialist nation. In response to his New Year Address, the people in the Democratic People’s Republic of Korea have made fresh upsurge in all economic sectors in the spirit of the “Masikryong Speed”. Readjustment of the West Sea Barrage-Sinchon-Kangryong and Ongjin waterways was finished in ten days, while more than 1,000 hectares of fruit field has come into being in Pukchong County, South Hamgyong Province. The Pyongyang Essential Foodstuff Factory and the Phyongsong Synthetic Leather Factory have become streamlined and the Vitamin C Factory and the Turf Research Center of the State Academy of Science were newly built on a modern basis. Pyongyang, August 20 (KCNA) — The Vitamin C Factory was modernly built at the Pyongyang Biotechnology Center located on the bank of the River Taedong. With the operation of the factory, the center has developed into a comprehensive microbe fermentation researcher base and producer vital to developing agriculture, light industry and public health. The center has turned out agrochemicals, anti-oxidation drinks EM-X, microbe fermentation accelerants, water purifier, digestive, etc. All of those products are highly appreciated at home and abroad. The center also has a biotechnology institute, compound microbiological fertilizer factory and experimental factory. Neither the “Vitamin C Factory” nor the “Pyongyang Biotechnology Center” are ever mentioned again in the English-language state media. The Korean name of the “Pyongyang Biotechnology Center” (평양생물기술연구원) appears in this Naenara article dated 2015-6-24. And now you know….the rest of the story. The Pyongyang Essential Foodstuff Factory, important symbol of North Korea’s nationalized industrial sector, celebrated the 70th anniversary of its foundation on August 10, 2016. It was the first factory to come under state management following the adoption of the Major Industries Nationalization Law on the same day. In commemoration of the anniversary, the Central Committee of the WKP sent a congratulatory message, while Pyongyang City Party Secretary Kim Su Gil, head of the factory Ri Gun Il, chief engineer Son Hyon Chol, and shop floor head Rim Jin Myong were in attendance. In accordance with this, all property of Japanese companies and individuals, and national traitors, including factories, mines, power plants, railways, communications, banks, retail enterprises, and cultural institutions, were confiscated and nationalized. Located in the Songyo District of Pyongyang, it began in late 1945 by producing soy sauce and soy bean paste. In January 1961, on the orders of Kim Il Sung, it merged with Songsin Oil Factory. It was further remodeled in 1967, and began to produce synthetic seasoning. In April 1982, at around the 27th anniversary of Chongryon, a patriotic fermentation soy sauce works was constructed. Remodeled in 2013, it takes up a total area of 102,000 square meters, with a floor space of 63,900 square meters. It produces a range of products including soy bean paste, soy sauce, cooking oil, seasonings, salt and vitamin E-related products. Kim visited Machine Factory run by Ho Chol Yong on May 19th and ordered to complete the modernization of the plant by the ruling Party’s founding anniversary in October. Since his first visit 10 years ago, he has provided field guidance to this factory in 2013 and 2014. During the Seventh Party Congress, Kim Jong Un said that the machinery industry is the touchstone of economic and technological development. He also directed to introduce a state-of-the-art equipment system and modernize a production line by updating existing equipment for maximum capacity in the machinery sector. Kim Jong Un has visited 10 different machinery factories this year alone, placing considerable attention on making improvements to advance and modernize this industry. The Korean Central News Agency Thursday released a report on the successful conclusion of the 70-day campaign with a great victory to be specially recorded in the history of the Korean nation under the guidance of Marshal Kim Jong Un. According to the report, the capabilities for self-defence including the capacity of nuclear attack of Juche Korea have been remarkably bolstered and the campaign plan has been over-fulfilled 44 percent in terms of industrial output value, and industrial production has grown 1.6 times as against the same period last year. Signal successes have been achieved in the development of Korean-style smaller nuclear warhead, simulated test of atmospheric re-entry of a ballistic missile, test of high-power solid-fuel rocket engine and stage separation, test of high-power engine of inter-continental ballistic missile. Workers in the four vanguard fields have performed labor feats in the van of day-and-night campaign. Those in the field of power industry honored their 70-day campaign quotas at 110 percent. I am not one to draw major conclusions from the order of mentions of areas in reports such as this one, but if the order says anything about priorities, it is worth noting that energy shows up first among other areas than missiles and nukes. Recall that energy has been emphasized by media tied to the North Korean regime. The Ministry of Coal Industry carried out its coal production plan more than 10 days ahead of schedule and results of capital tunneling and preparatory tunneling have jumped several times as against those in the past. Those in the steel field and miners hit the goals of production of Juche iron, rolled steel and iron ore. The field of railway transport carried out the plan for the transport of major freight at 124 percent. More than 70 farm machines of over 20 types have been invented and manufactured, typically potato harvester, self-propelled sprayer, combined plowing machine, combined soil governing machine, small multi-purpose farm machine and combined rice thresher. Those in the fishery field built multi-purpose fishing boats of “Hwanggumhae” series by their own efforts and with indigenous technology in a brief span of time and put them into operation. The plan for the production of machine tools has been over-fulfilled more than 60 percent and index-specific campaign plans have also been carried out in the machine-building industrial field. Workers in the Namhung Youth Chemical Complex and Hungnam Fertilizer Complex produced 1.2 times as much fertilizers as before and the February 8 Vinalon Complex significantly increased the production of vinalon and various kinds of other basic chemical goods. The nationwide cement production plan has been carried out at 141 percent and a boost has also been recorded in the production of varieties of building materials including glass. Workers of forestry stations and mine pillars production stations honored timber production plan set by the Ministry of Forestry at 137 percent. Agricultural workers across the country have made full preparations for farming by their devoted efforts. But note that no numbers are given for farming output, or any agricultural output other than fishing and seaweed. Officials and workers in the fishery field have over-fulfilled their plan for fishing and seaweed culture more than 10 percent when the results of the Ministry of Fisheries are taken as a whole. The gross industrial output value in the field of light industry has been over-fulfilled 54 percent and the index-specific performance has shown a marked jump over the period before the campaign. A number of consumption goods producers have hit their goals for the first half of the year or the yearly ones. Some of them even set a record by fulfilling two-year production quotas. Those in the field of land and environment protection and workers and other people across the country including youths and students planted hundreds of millions of trees in mountains covering more than 100 000 hectares. The Paektusan Hero Youth Power Station No. 3 and the Wonsan Army-People Power Station have been successfully completed. In just one month after breaking the ground for the construction of Ryomyong Street, its builders finished ground excavation for dozens of blocks of apartment houses and are now pushing forward the ground concrete tamping in its final stage. Baby homes, orphanages, orphans’ primary and secondary schools sprang up across the country and the Mindulle Notebook Factory was built. New structures have been built one after another. They include Dyke No. 2 of Nunggumdo Tideland, Outdoor Sapling Cultivation Ground of the Central Nursery of the Ministry of Land and Environment Protection and Pyongyang Athletic Apparatus Factory. Scientists and educators across the country registered three times as many research achievements as against the same period last year to be conducive to the economic development of the country and the betterment of the people’s living standard. Unprecedented achievements have also been made in the fields of literature, arts, education, public health and sports. The 70-day campaign of loyalty clearly showed the world how the great Kim Jong Un‘s Korea is advancing toward the eminence of the century. The full article was published by KCNA on May 6th. The Hwanghae Iron and Steel Complex, one of the model units in the current 70-day campaign of loyalty, hit its steel and pig iron production targets 101 percent respectively as of April 20. Smelters of the UHP electric arc furnace have so far reset the peak production record of molten iron per charge several times. They gave full play to the spirit of collectivism of helping and leading one another forward, while introducing advanced working methods to shorten the time of heating and increase the output of molten iron per charge. The workers of the continuous ingot steel workshop carried out their daily production plan at 102 percent on average, 110 percent at maximum. Those of the Sunchon Cement Complex drastically raised cement production on the first day of the campaign to renew the daily peak production record for the first time in 20 years. Without resting on their laurels, they worked hard and finally achieved their campaign goals. The Ministry of Coal Industry carried out its highly-set campaign target ahead of schedule as of April 20 with the coal production plan 101 percent and major, preliminary and boring tunnelling 101.5, 105.5 and 106. 6 percent respectively. Coal-mining machine factories across the country manufactured and repaired thousands of coal wagons and made over 1 800 wheels more than planned under the uplifted self-development-first banner. A great deal of achievements were also made in the production of coal-mining equipment and their parts. The Chongchongang Thermal Power Station increased power generation to exceed its campaign plan by 2.2 percent as of April 25. The workers of the station repaired equipment and increased the number of boilers in operation to ensure uninterrupted power generation. The February 8 Vinalon Complex gave priority to the supply of raw materials and fuel, staggered production and organized management of equipment and technology scrupulously to boost production, thereby surpassing the vinalon production goal by 50 percent. Workers of the Wonsan Salt Works increased production 2.2 times over the same period of last year by fully storing seawater in reservoirs while introducing an advanced seawater freezing method which suits the conditions on the east coast throughout the winter. Thousands of hectares of farmland have been rezoned in Kaesong and Jangphung County, with over 19 300 patches and paddies and more than 1 260-kilometre-long ridges between paddy and dry fields removed and hundreds of hectares of land brought under cultivation. This paved the way for comprehensive mechanization of farming on all fields and consequent increased cereals production. Officials and workers of the Sinuiju Textile Mill have produced three times more cotton yarn and fabrics than before the campaign. Amidst the dynamic collective emulation drive between workteams, shifts and workshops, many workers and workteams have carried out the first half year and annual production plans as well as campaign plans and the number is growing. More than 200 factories and enterprises in Pyongyang have hit their 70-day campaign goals and first half year plans ahead of schedule. Industrial output grows rapidly thanks to the heightened revolutionary enthusiasm and creative spirit of selfreliance and self development of service personnel and people, who have risen up in the day and night march true to the call of the Central Committee of the Workers’ Party of Korea for launching a 70day campaign of loyalty for the Seventh Party Congress, according to a report of the Korean Central News Agency on March 12. The nation’s industrial production increased 1.2 times in the first ten days of March over the same period of last year. The Pukchang and Pyongyang thermal power complexes and other thermal and hydropower stations across the country pressed on with power generation as scheduled, far exceeding the tenday targets set by the Party. Coal mines in the western areas including Tokchon and Sunchon cut thousands of tons of coal more every day. The Ministry of Coal Industry overfulfilled the tenday production plan by 13 per cent and the results of major and preliminary tunnelling far surpassed the plan, securing hundreds of reserve coalcutting faces. The workers of the Hwanghae Iron and Steel Complex doubled the Juche iron output over the same period of last year, and all metallurgical bases conducted a dynamic drive to increase iron and steel production. Amidst the heated emulation and experiencesharing in iron ore mines in Musan, Unnyul, Thaethan and other areas, the Jaeryong Mine increased daily production over 1.5 times on average, thus taking the lead in the supply of concentrated iron ores to metallurgical factories. The Ministry of Railways, all the railway bureaus and their branches commanded railway transport scrupulously and gave top priority to concentrated transport without accident to overfulfil the plan for main freight. The increased production in the vanguard economic sectors injected a new lease of life into the overall major industrial sectors such as machinebuilding, chemical, building materials and mining industries and forestry. The Taean Heavy Machine Complex completed the production of generating equipment till March 9 in a matter of two months and sent them to the construction site of Paektusan Hero Youth Power Station No. 3 on March 10. The workers of the large machinebuilding bases in Ragwon and Ryongsong and the Sungni Motor Complex speeded up the processing of products and increased the production of spare parts including various kinds of gears and speed reducers, a great contribution to a 1.5 times rise in the production of thermal power generating equipment of the Ministry of Machine Building Industry. The workers of the Hungnam Fertilizer Complex hit the Juche fertilizer production target for the first ten days of March. Cement production is also growing in the Sangwon Cement Complex whose workers and technicians have turned out to break the production record again this year after last year. Many forestry and prop production stations carried out their first quarterly and yearly timber production quotas. Farming preparations were brisk on the agricultural front, resulting in a 1.7 and 2.8 times growth in the securing of hukposan and microbial fertilizers and an over 1.3 times increase in the acreage of field carpeted with humus soil. Officials and fishermen carried out the plans of the Ministry of Fisheries for ten days 121 per cent. Daily amount of catch increased rapidly and fishing results saw a leap in the fishery stations on the east and west coasts. Hundreds of workers hit their targets for the first quarter and half of the year in the field of textile industry. Kumkhop, Pomhyanggi and Maebongsan and other popular brands saw a sharp rise in sales. Many major construction projects progressed apace including those for Paektusan Hero Youth Power Station No. 3, reconstruction of Kim Il Sung Stadium, secondstage reconstruction of the Central Zoo, capacity builup of the Central Tree Nursery of the Ministry of Land and Environment Protection, the central class education hall and Wonsan Army People Power Station. Many young people volunteered to work in labour consuming fields and hundreds of workers carried out their yearly plans. The Korean Central News Agency Saturday said in a report that the industrial production in the first ten days of March when the 70-day campaign of loyalty is under way grew 1.2 times as compared with the corresponding period of last year. According to the report, production in the vanguard and basic industrial fields of the national economy including electric power, coal, metal and railway transport sharply rose. Thermal power plants and hydro-power stations across the country have over-fulfilled their daily quotas. The production plan of the Ministry of Coal Industry for ten days in March was over-fulfilled 13 percent. The workers of the Chollima Steel Complex boosted the production of rolled steel 32 percent. A dynamic drive for increased iron and steel production is under way in metallurgical bases across the country including the Hwanghae Iron and Steel Complex. The Jaeryong Mine increased daily quotas over 1.5 times on an average, thus taking the lead among the iron ore mines in Musan, Unryul, Thaethan and other areas. The Ministry of Railways, all the railway bureaus and sub-bureaus over-fulfilled main freight haulage plan. The increased production in the vanguard sectors of the national economy injected vitality into major industrial fields such as machine-building, chemical, building material and mining industries and forestry. The custom-built equipment for different fields of the national economy were turned out and the production of nonferrous metal ore, chemical fertilizers, cement, sheet glass, timber, etc. radically increased. The Taean Heavy Machine Complex completed the production of generating equipment in a matter of two months and sent them to the construction site of the Paektusan Hero Youth Power Station No. 3 on Mar. 10. The Ministry of Machine Industry increased the production of thermal power generating equipment 1.5 times. Mines under the Phosphate Fertilizer Industry Management Bureau honored its plan at 150 percent. The workers of the Hungnam Fertilizer Complex hit the goal for the production of Juche fertilizers. The workers and technicians of the Sangwon Cement Complex are working hard to surpass the peak production year again this year. The Sunchon Cement Complex, the Chonnaeri Cement Factory and the Sunghori Cement Factory boosted the production over 10 percent. Many forestry stations and pit prop production stations also honored their first quarterly and yearly timber production quotas. The production of homemade fertilizers and their transport, tractor overhauling and maintenance and other farming preparations are nearing completion thanks to the devoted drive of agricultural workers across the country. The fishery officials and workers over-fulfilled their production plan of the Ministry of Fisheries for ten days 21 percent. The field of light industry over-fulfilled the production plans for textiles, knitwear and shoes. In the field of textile industry hundreds of workers honored the half yearly and first quarterly quotas and famous products and goods favored by the people are on the increase. Many major construction projects are making rapid progress. A lot of young people volunteer to work in the hard and labor-consuming fields. Across the country hundreds of workers honored their yearly plans, at least 3,600 people carried out the first half yearly plans and more than 15,400 people hit the first quarterly goal. A lot of members of the women’s union are giving helping hands to builders in power stations, workers of coal and ore mines. War veterans, honorary party members and pensioners have turned out in the 70-day campaign in South Phyongan Province and other parts of the country to fully demonstrate the noble traits of our society advancing with the might of single-minded unity. The DPRK has made a rapid progress in major construction or reconstruction projects and industrial production in recent 40 days after the start of the 70-day campaign. In particular, Pyongyang, its capital city, showed an increase of twice in the tempo of construction or reconstruction projects and 1.6 times in industrial production. The Aeguk Vegetable Processing Factory and the Mangyongdae Children’s Camp were rebuilt on a modern basis and the second-stage renovation of the Central Zoo is progressing apace at the final stage. Besides, 80 percent of total work has been carried out in scores of construction and reconstruction projects, including the Ryuwon Shoes Factory, Pyongyang Cosmetics Factory and the Pyongyang Cornstarch Factory. Electricity and coal outputs went up at thermal-power and hydro-power stations and coal mines. The Pyongyang Steel Works and the Pyongyang Cast Iron Pipe Factory fulfilled their production plans 120 percent on an average, 150 percent to the maximum. An increasing number of units in light industry and foodstuff industry have finished their yearly and half-yearly production quotas. Such successes are reported from railway, agricultural and other industrial sectors. 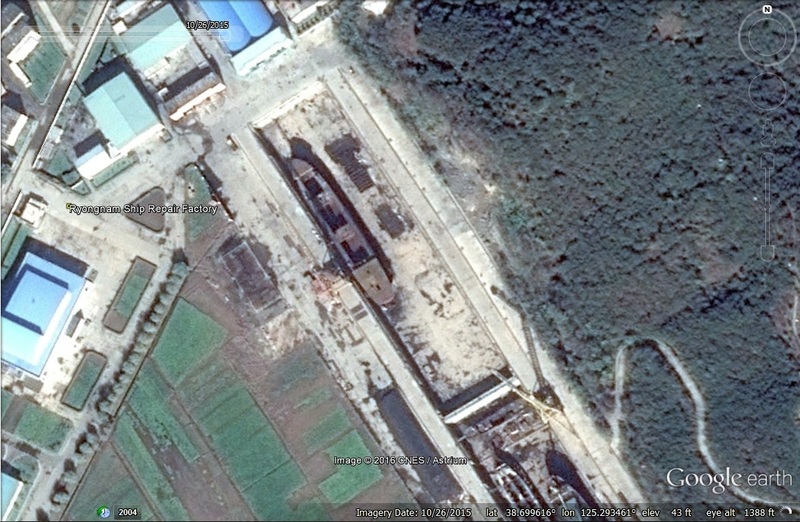 Pictured above (Google Earth): The Jaryok (자력) under construction at the Ryongnam Shipyard in Nampho. Nampho, April 17 (KCNA) — The DPRK 5 000-ton trade cargo ship “Jaryok” (self-reliance) set sail. Respected Supreme Leader Kim Jong Un set forth a task on making a 5 000-ton cargo ship and named it in person. Workers, technicians and officials of the Ryongnam Dockyard built the “Jaryok” on the occasion of the Day of the Sun and thus provided another material and technical foundation for developing the maritime transport of the country. Its sailing ceremony took place at the Ryongnam Dockyard on Monday. Present there were O Su Yong, vice-chairman of the Central Committee of the Workers’ Party of Korea, officials concerned and of the dockyard and others. Kang Jong Gwan, minister of Land and Maritime Transport, made an inaugural address to be followed by speeches. The ship left amid the send-off by the participants. 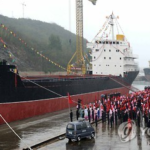 5,000-ton trade cargo ship “Jaryok” (self-reliance) was built as a present to the Seventh Congress of the Workers’ Party of Korea (WPK). The ship was launched with due ceremony at the Ryongnam Dockyard on Sunday. Present at the ceremony were O Su Yong, vice-chairman of the Central Committee of the WPK, officials concerned, officials and employees of the dockyard. Kang Jong Gwan, minister of Land and Maritime Transport, made an address for the launch to be followed by some speeches. They said the present success is ascribable to the patriotic devotion of President Kim Il Sung and leader Kim Jong Il to the development of maritime trade and to the leadership of MarshalKim Jong Un and it is also a proof of the loyalty of the working people and officials in the maritime transport field to the party who are determined to bring in earlier the final victory of building a thriving socialist country. They referred to the fact that Kim Jong Un personally named the cargo ship “Jaryok”. The loving care and trust of Kim Jong Un is associated with the intention wanting to dynamically promoting the development of the maritime industry in the spirit of self-reliance and self-development, they noted. They called for attaining the high goal for the development of maritime industry by displaying the revolutionary spirit and mettle of heroic Kim Il Sung-Kim Jong Il working class in close unity around Kim Jong Un and dynamically fighting for the final victory of building a thriving socialist country. A tape was cut and the cargo ship slid off the launching ways to the sea. Here is footage from KCTV. See more analysis by Leo Byrne at NK News here. Michael Madden also provides information. Following North Korea’s self-proclaimed hydrogen bomb test on January 6, 2016, which highlighted the fact that North Korea is a nuclear-armed state, daily mass rallies have been held in order to stimulate economic development and cement national unity. The Korean Worker’s Party (KWP) mouthpiece Rodong Sinmun proudly announced on January 8th that the fourth nuclear test had been a ‘success’. It has been reported that mass rallies were held in North Phyongan Province, Jagang Province, Kangwon Province, North Hamgyong Province, Ryanggang Province, Rason City, and other regions as part of the effort to continue building a strong and prosperous nation. Each of these mass rallies included discussions on how to develop the economy so as to “achieve a golden age through the building of a strong and prosperous nation.” The purpose behind these daily mass rallies can be interpreted as both taking advantage of the opportunity provided by the nuclear test to strengthen solidarity of the people while also paving the way to maximize economic productivity ahead of the upcoming 7th Party Congress that is scheduled for May. The Sonhung Food Processing Plant was introduced as a model case example. According to North Korean media, the foods produced at this plant are all globally competitive goods, and the best products of the country. Although the plant has only been in operation for 10 years, the media claims that current annual net operating profits per employee are a staggering 350 times higher than those of their first year of operation, and the plant is known for this remarkable record-setting achievement. These formidable efforts also encompass the development of approximately 90 health products with high nutritional value over the past four years, including healthy danmuk. The news outlets also boasted that nine North Korean factories have received ISO 22000 (food safety management system) certifications. In addition, 60 products were registered as ‘February 2nd products’, and not long ago five food products, including fruit bread, coffee sweetener, and healthy danmuk, received ‘December 15th quality medals’. Supreme Leader Kim Jong Un’s New Year’s Address emphasized “improving the lives of the people” and encouraged various factories to achieve success. The propagation of these successes through the North Korean media outlets demonstrates Kim Jong Un’s intentions of inspiring loyalty from the people through intensive efforts to increase the quality of their diets. The newspaper commented that many monumental works had been created in 2015 that changed the country. The newspaper also introduced the recently completed constructions of Mt. Paekdu Hero Youth Power Station, multi-tier power stations on the Chongchon River, Future Science Street, Mangyongdae School Children’s Palace, Pyongyang Nursing Home, Mansudae Fountain Park, and “Mujigae” ferry on the Taedong River. In addition, the newspaper added that “scientification” was promoted in other sectors including education, sports, and culture. You are currently browsing the archives for the Manufacturing category.